A known and used process for thousands of years, metal casting involves the pouring of a molten metal into metal casting molds. These molds contain cavities which allow us to cast products into a desired shape. Once the molten metal has been allowed to cool and solidify, the casting is broken out or ejected from the mold. This part then, in some cases, undergoes further machining and finishing processes. One of the most recognized and highly specialized metal casting companies in China today, ChinaSavvy is a Western owned metal castings company operating to ISO 9001:2008 standards. This mold can produce only one metal casting, as the mold is destroyed in the ejection process. Intricate geometries are achievable when using expandable molds. While binders are used to help the mold material retain its form, usually made of plaster, sand, or similar materials. 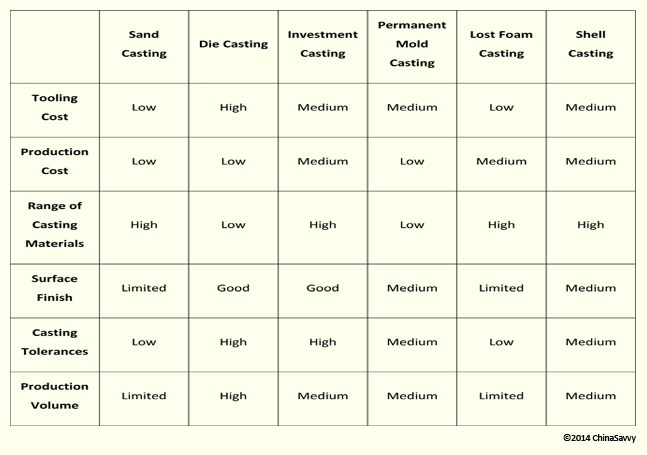 This type of mold can produce many castings (as it has sections capable of opening and closing) but limits the shapes of parts. Molds of this type are usually made of metal or a refractory material. Bronze, steel, aluminium, and stainless steel. Aluminium, bronze, iron, steel, and zinc. Zinc, aluminium, bronze, iron, and steel. Steel, zinc, aluminium, bronze, and iron. Patterns are a geometric replica of the desired metal casting, and are required for expandable mold processes. These patterns are usually slightly bigger, compensating for the shrinkage that commonly occurs during the cooling and solidification process. Parts made using expandable molds generally require a secondary manufacturing process (like machining). Machining and other secondary process do increase cost. However, by increasing the machining allowance, one also increases the surface finish, part dimension, and is able to compensate for several other variables. The material used to create the pattern depends on a few factors, including the type of metal casting process used, the mold used, the cast's desired size and geometry, the number of casts to be produced using the pattern, as well as the desired tolerance and dimensional accuracy required. Used for castings with internal geometries, a core is simply an inverse replica of the desired internal features of the part being casted. These cores are meticulously designed to compensate for shrinkage and are made of the same material as the pattern. Like the pattern, the core is ejected once the molten metal has cooled and solidified. Chaplets are used in cases where structural support is needed to help keep the core in place. These chaplets are made of a material that has a higher melting point than the material being poured, allowing it to become a part of the part as the molten metal solidifies. A mold consists of the cope (which is the top) and the drag (which is the bottom). Patterns are then placed inside molds to leave behind the pattern impression. Parting lines are formed between the cope and the drag, allowing for the mold to be opened and the pattern to be removed. After the pattern has been removed, the cores are placed (with chaplets if needed), leaving behind the geometry of the part that is to be casted. For the molten metal to be poured, gating systems need to be added to the mold. These gating systems can be curt by hand or, by using more specialized methods, be added into the pattern along with the part. The location at which the molten metal enters the mold. These basins are designed to reduce turbulence. The location through which the molten metal travels when leaving the pouring basin. Tapered, the down sprue has a reduced cross-section as it moves downwards. The location through which the molten metal passes after leaving the down sprue and before entering the inner mold area. It is vital for regulating the molten metal flow. Passages (almost like tunnels) through which the molten metal is distributed throughout the mold. This is the impression of the actual part that needs to be casted. Needed allow gases formed during the solidification process to escape. Described as reservoirs for molten metal, risers are responsible for feeding metal to various sections of the mold in order to compensate for shrinkage during the cooling and solidification process. There are four types of risers namely blind risers, open risers, side risers and top risers. The process by which molten metal is delivered into the casting molds, involving the flow of the metal through the gating system and into the casting or cavity. 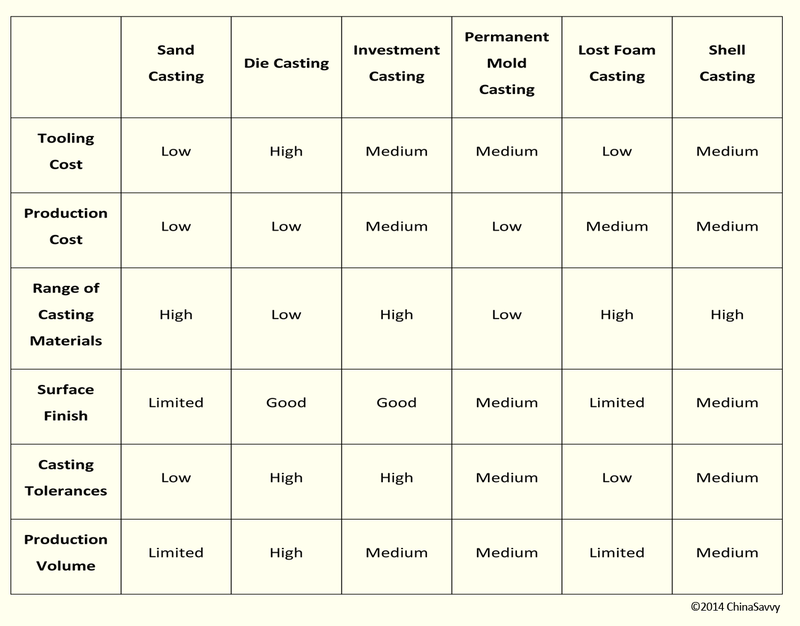 While the temperature must always be higher than that required for solidification; the temperature of each metal, as well as casting process, will differ. Superheat is the difference in temperature between the pouring temperature and the solidification (or cooling) temperature. A strict balance in volumetric rate is necessary during the pouring process. If the pouring is too slow, the molten metal can cool and solidify before properly filling the mold, while 'too-high' a pouring temperature can result in turbulence. Aninconsistent variation in the speed of the pouring process as well as the direction of flow throughout the molten metal itself, causing turbulence. Turbulence causes mold erosion and can also lead to an increase in the formation of metal oxides, resulting in porosity. ChinaSavvy, being a highly specialized metal castings company, also delivers post-casting services, including CNC Machining Polishing, Plating and Coating.